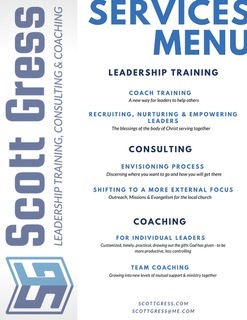 The menu of services gives you an overview of the variety of ways Scott can partner with you through coaching and consultation. You can also connect with Scott to talk more about his services by completing the contact form or visiting his website. To learn more about the services offered, please explore Scott’s Website www.scottgress.com.